For the past 15 years, Otterbine's Sunburst aerating fountain has created a stunning centrepiece to the heart of Ladbrook Park Golf Club in the Midlands. 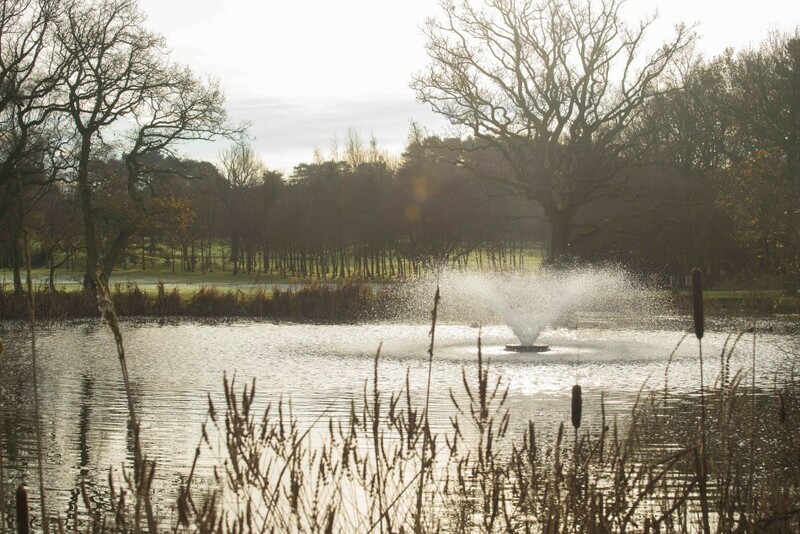 "The lakes are central to the course and provide the backdrop to many of our 18-holes, so having a reliable aerating fountain that keeps the water clean and clear, while also creating a striking centrepiece is of the utmost importance. "For 15 years, the Sunburst has given us everything we needed. When we first excavated the lakes in conjunction with a local contractor, there was a transition period when we had a lot of weed and algae build up which was causing problems and fixing that as soon as possible was a real priority." To combat this, the club worked with a water management company who recommended the Otterbine Sunburst fountain. Everyone was confident the Sunburst was up to the task of keeping such a large body of water in good condition, and that confidence was well founded! "Once we had the fountain installed it solved all of our problems within a couple of weeks," says Kevin. "You could see the improvement pretty much immediately, which definitely gave us peace of mind we'd made the right choice." The club excavated the lakes itself, not just to create beautiful surroundings for golfers, but to give themselves a source of water for irrigation purposes. With the Otterbine aerating fountain, the water is a good enough quality to use for irrigation across the course and, without having to rely on the mains water supply, the club has saved money and gained peace of mind from its ability to be self-reliant, which "has been a real bonus" says Kevin. During its time at the club, the fountain has performed brilliantly, and Kevin doesn't expect that to change. "The fountain hasn't let us down yet, and it's over a decade old! We have routine inspections anyway and knowing we have the back-up from Otterbine and its distributor Reesink Turfcare should we need it is enough to guarantee peace of mind." He concludes: "The Otterbine fountain has not only been one of the best investments we've made, it's part of the scenery here at Ladbrook Park. It's cost effective to run and has proven itself to be a really reliable product which is quite literally at the heart of the course."